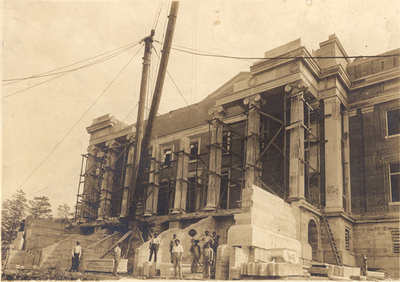 The cornerstone for the second Van Meter Hall was set on February 26, 1910. Inside were placed a school catalog, a list of students and alumni and an issue of The Elevator. This photograph shows continued construction of Van Meter Hall. The existing Van Meter Hall was named after Vanmeter Hall which was part of the Southern Normal School & Business College in order to show the continuity of the Southern Normal School in the newly established Western Kentucky State Normal School. The current Van Meter Hall is the second so named in WKU's history. It was dedicated on Friday, May 5, 1911, The building as first built had an auditorium with a seating capacity of 2,000 wherein WKU students attended chapel daily. Van Meter also contained classrooms, a library and administration offices.